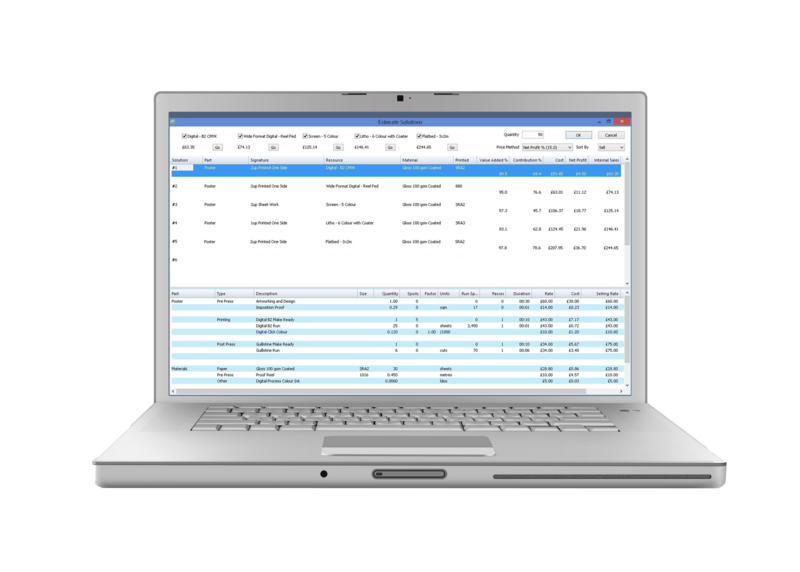 This powerful estimating engine allows users with more limited experience of print production processes to calculate accurate estimates based on your pricing policies and preferred production route. The tool captures the information you require for workflow automation, including web-to-print and JDF integration. A complex set of algorithms are at work behind the scenes, meaning you can generate more estimates, more quickly, and amend existing ones at the click of a button. Instantly compare costs and pricing between all the available methods of production (e.g. between your offset litho and digital presses) and then select the best option for your business from the different solutions presented to you. The estimating engine uses pre-defined product types and production routes to create estimates, which removes the guesswork out of estimating for print and keeps pricing consistent. Estimators run through a user-defined checklist of options for a chosen product, so even staff with limited print production knowledge can create complex quotes.